Le Conseil Consultatif des Chapitres de l’Internet Society est un organe consultatif de l’Internet Society représentant ses Chapitres, tel qu’autorisé à l’Article VIII, Section 2 des Statuts de l’ISOC. L’objectif principal du Conseil consultatif des Chapitres sera de canaliser et de faciliter les conseils et les recommandations au président et au Conseil d’administration de l’Internet Society de manière ascendante, sur toute question d’intérêt ou d’intérêt pour les Chapitres du CA et de l’ISOC. Ces conseils et recommandations peuvent concerner les politiques, stratégies et opérations de l’ISOC, en particulier en ce qui concerne les besoins et les priorités des sections et de leurs membres. Le Conseil consultatif des sections encouragera et facilitera la communication et la collaboration entre les Chapitres, les administrateurs, le personnel de l’ISOC et les autres membres de la communauté de l’ISOC. De plus, le Conseil consultatif des Chapitres peut servir d’organe consultatif au président et aux administrateurs, en cas de différends ou de changements de statut liés aux chapitres. Chaque Chapitre en règle peut nommer un délégué au Conseil consultatif des sections conformément à ses propres procédures de sélection. Un comité de direction est composé de neuf (9) membres élus ou nommés parmi les délégués de la section. Vous trouverez plus d’informations sur les membres des comités de pilotage de 2017 et 2016 sur la page du Comité de direction de la section AC. La liste des représentants actuels des Chapitres est disponible ici. Lisez la Charte du Conseil Consultatif des Chapitres ici. La traduction en français est disponible ici. 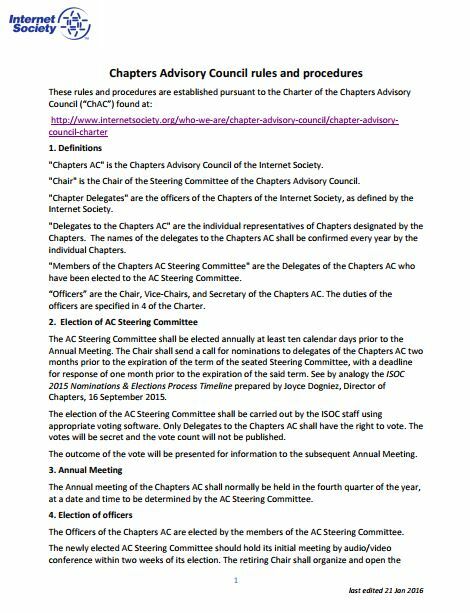 These rules and procedures are established pursuant to the Charter of the Chapters Advisory Council (“ChAC”). « Chapters AC » is the Chapters Advisory Council of the Internet Society. « Chair » is the Chair of the Steering Committee of the Chapters Advisory Council. « Chapter Delegates » are the officers of the Chapters of the Internet Society, as defined by the Internet Society. « Delegates to the Chapters AC » are the individual representatives of Chapters designated by the Chapters. The names of the delegates to the Chapters AC shall be confirmed every year by the individual Chapters. « Members of the Chapters AC Steering Committee » are the Delegates of the Chapters AC who have been elected to the AC Steering Committee. “Officers” are the Chair, Vice-Chairs, and Secretary of the Chapters AC. The duties of the officers are specified in 4 of the Charter. The AC Steering Committee shall be elected annually at least ten calendar days prior to the Annual Meeting. The Chair shall send a call for nominations to delegates of the Chapters AC two months prior to the expiration of the term of the seated Steering Committee, with a deadline for response of one month prior to the expiration of the said term. See by analogy the ISOC 2015 Nominations & Elections Process Timeline prepared by Joyce Dogniez, Director of Chapters, 16 September 2015. The election of the AC Steering Committee shall be carried out by the ISOC staff using appropriate voting software. Only Delegates to the Chapters AC shall have the right to vote. The votes will be secret and the vote count will not be published. The outcome of the vote will be presented for information to the subsequent Annual Meeting. The Annual meeting of the Chapters AC shall normally be held in the fourth quarter of the year, at a date and time to be determined by the AC Steering Committee. The Officers of the Chapters AC are elected by the members of the AC Steering Committee. The newly elected AC Steering Committee should hold its initial meeting by audio/video conference within two weeks of its election. The retiring Chair shall organize and open the meeting and preside over the election of new Officers. If the retiring Chair has been reelected and has been nominated for an Officer position, a retiring Member of the AC Steering Committee who is not a nominee for an Officer position shall chair the initial meeting. If all members of the AC Steering Committee are nominees for an Officer position, or if the AC Steering Committee fails to agree on a chair for the initial meeting, then the initial meeting shall be chaired by the ISOC Staff liaison who supports the Chapters AC. The newly elected members of the AC Steering Committee may submit nominations, including self-nominations. At the initial meeting, there shall be an opportunity for nominees to present themselves. If there remains more than one nomination, the ISOC Staff liaison shall conduct a confidential vote and announce the results. The vote may be conducted by electronic means. Meetings of the Chapters AC shall be organized in accordance with Paragraph 7 of the Charter. The Chair shall consult the full AC Steering Committee when developing agendas. The AC Steering Committee supervises the development and approval by the Chapter AC of all advice and recommendations. Thus it does not make substantive decisions. Decisions of the Steering Committee, e.g. regarding rules and procedures, procedural matters, scheduling of meetings, etc., shall normally be made by consensus (meaning lack of formal opposition). If consensus cannot be achieved, then any member of the Steering Committee can ask that the decision be taken by a majority vote of the members of the AC Steering Committee. In case of vote, the quorum shall be seven members; in case of tie, the Chair shall cast the deciding vote. All votes shall be open and transparent. Substantive decisions, in particular regarding advice and recommendations, shall be made by the AC. Decisions may be made by electronic means (e.g. E-Mail, electronic voting systems, etc.) or during remote (audio/video conferencing) or physical meetings. Decisions shall normally be taken by consensus (meaning lack of formal opposition). If consensus cannot be achieved, then the Chair of the AC Steering Committee shall organize a vote. In case of voting, decisions shall be taken by a majority vote of the delegates to the AC. The quorum shall be nineteen (19) delegates. In case of tie, the matter will be resubmitted for discussion and a new vote. Votes will be secret. The tally of votes (for, against, abstain, did not vote) will be published. Abstentions will be counted towards determining the quorum. The Steering Committee may assign any of its members, or any delegate to the AC, to investigate or report on a specific topic, on the basis of specific expertise of the person or persons in question, with the consent of the person or persons in question. The Steering Committee, through its Chair, will consult the delegates to the AC to determine the topics for which advice and recommendations should be developed. For each specific topic, the Steering Committee will appoint one or more of its members to act as facilitator of a discussion within the AC and editor of a draft text. When the facilitator(s) is/are of the view that the text has sufficient support, it will be submitted for formal approval to the AC. Any delegate to the AC shall be entitled to attach comments to an approved text: such comments can underline or contradict portions of the approved text. Pursuant to Paragraph 3.3 of the Charter, a delegate to the Chapters AC may be removed by the Chapter that appointed the Delegate (through the Chapter’s own explicit procedures), or by a two-thirds vote of the Delegates to the Chapters AC, after written notice (which may be given by E-Mail) and an opportunity to respond. The period of notice shall be at least 30 days prior to the vote. The vote shall initiated by the Chapters AC and it shall be organized by the ISOC staff. The vote shall be secret. The challenged delegate to the AC shall be removed only if two-thirds of all the delegates to the Chapters AC vote in favor of removal (that is, if there are 66 delegates to the AC, then at least 44 votes for removal would be required). If a delegate who is removed is a member of the AC Steering Committee, the removed delegate shall be deemed to have resigned from the AC Steering Committee and shall be replaced accordingly. If a member of the AC Steering Committee resigns (or is deemed to have resigned), then the Chair will invite the ISOC staff that supports the AC to organize nomination and election of a replacement member. The nomination and election process will be the same as that used for elections of the entire Steering Committee, except that the number of people elected will be smaller. The replacement member will serve the same term as the member that is replaced. If an officer of the AC resigns (or is deemed to have resigned) from the Steering Committee, then the Chair will organize the election of a replacement officer, using the same process that is used to elect all the officers. A member of the AC Steering Committee may resign from the Steering Committee without resigning as a delegate to the AC. An officer may resign as officer without resigning as a member of the Steering Committee. If the Chair resigns (or is deemed to have resigned), the AC Steering Committee will appoint a replacement who will act as Chair on a temporary basis. If the AC Steering Committee is unable to agree on a temporary Chair, then the Vice-Chair from the most recently created Chapter will act as temporary Chair. The ISOC Staff liaison shall determine the seniority of the concerned Chapters. The temporary Chair will organize the election of a replacement Chair in accordance with the procedures for election of Officers. Any vacancies of Officers that may result from the said election will be filled in accordance with the procedures for election of Officers. Read or download the proposal here. Framework for ISOC’s Engagement with Membership re Policy work – Brief for the Board – can be found here. ISOC Improving support for chapters, approved by the Chapters Advisory Council as of 1 November 2016, can be found here. Process for selecting chapter participants in ISOC delegations, approved by the Chapters Advisory Council as of 1 November 2016, can be found here.